Anyone who’s ever undergone surgery knows that it can be downright terrifying, but it really helps to have a friendly face by your side. Luckily, there are awesome people who willingly support ailing patients through the process, like this vet who sang to a nervous dog before surgery and stole our hearts at the same time. As People reports, a dog named Ruby was scheduled for a spaying surgery at Fox Hollow Animal Hospital in Lakewood, Colorado, but was understandably shaken by a case of nerves. Fortunately, Dr. Ross Henderson comforted the doggie by singing and playing the guitar. 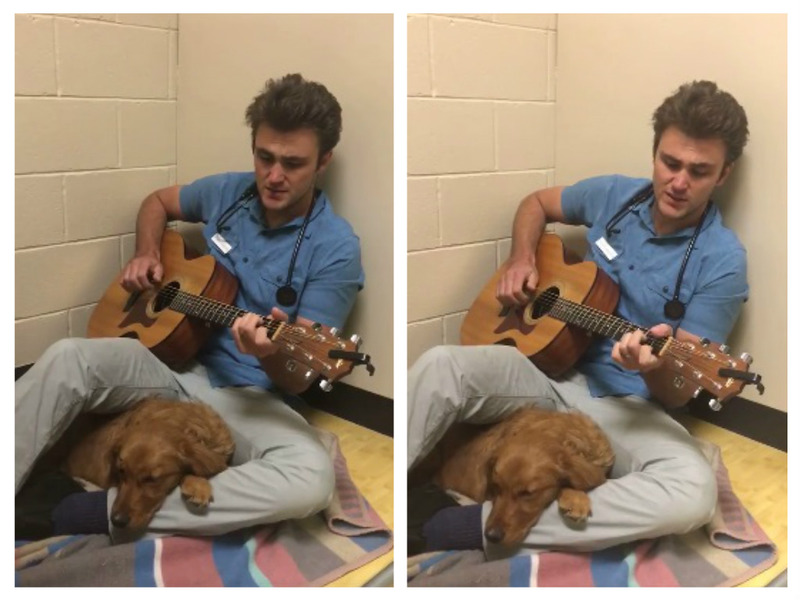 In a heartwarming video that the animal hospital posted on Facebook, Dr. Henderson and the dog can be seen cuddling on the floor, as the doc plays the guitar and sings Elvis Presley’s “Can’t Help Falling in Love.” The clip has earned over 550,000 views and more than 6,000 shares, with commenters praising the vet’s thoughtful gesture. Apparently, Dr. Henderson’s a regular musical zen master when it comes to calming anxious patients: He keeps his guitar at the hospital to help nervous animals get over their pre-surgery jitters. As for Ruby, we hope she’s getting all the rest and relaxation she needs to make a speedy recovery.